Will Michael Schumacher Drive for Mercedes in 2010? Will he or won’t he? That’s the question the Formula 1 world is asking about seven-time champion Michael Schumacher as reports continue to swirl that he is planning a comeback to full-time racing in 2010 with the Mercedes team. BBC Sport Formula One expert Eddie Jordan reported that Mercedes has been in contact with Schumacher – who retired in 2006 – to fill one of their spots in 2010. Jordan says the move would be a “stopgap” measure until Mercedes is able to convince rising star Sebastian Vettel to leave the Red Bull team. 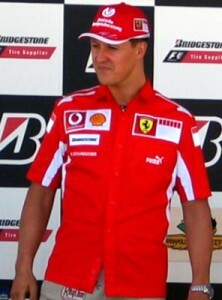 Schumacher had announced plans to drive for Ferrari this past season as an emergency replacement for the injured Felipe Massa, but had to halt his comeback plans because of a persistent neck injury.